One of my favorite things about going on vacation is the guarantee of unfettered space in which to read. I have not yet warmed up to the eyepod, and I usually turn to reading instead of digital music as my way of passing that public transit time that comes (for some of us) with the commencement of a journey. Even in commuting, I enjoy a quick twenty-minute read (sometimes longer, depending on the whims of Muni) from whichever book I am carrying around on that particular day. The inevitable literary but noisy BART trip from San Francisco will also involve a brief but reading-accessible “Air-Bart” bus ride from the Oakland Airport BART station to the loading zone of the airport itself. For the sake of brevity, criticisms on why our system does not just connect to the airport itself will be saved for another post! Waiting around in the airport in that pre-holiday madness only serves to give us more time to chill out, and read something. With all the waiting around in the airplane and various trains, one could read a selection of different things, which begs the questions: how many books is it reasonable to bring on vacation? I always overzealously pack more books than I seem to be able to read. But my eyes are always bigger than my stomach, as one could say. Commonly other books and magazines or newspapers are picked up along the way and supplant the originally packed materials, creating all sorts of overlapping capacities amongst the abundant resources. This holiday season, I head back into the hinterlands of suburban southern California, from where I came and will celebrate American Christmas with my family, before moving on to the greater San Diego area southwards. This will necessitate a delightful train ride with ample reading time involved, as mentioned in a post from earlier this month. The original reading intentions may be interrupted again, as it is quite something to see Los Angeles and the areas south of there from the rails than from the roaring concrete slab lined with advertisements and box stores. I think I have brought up to four or five books for a week’s vacation before, and will often read only one or two of them. 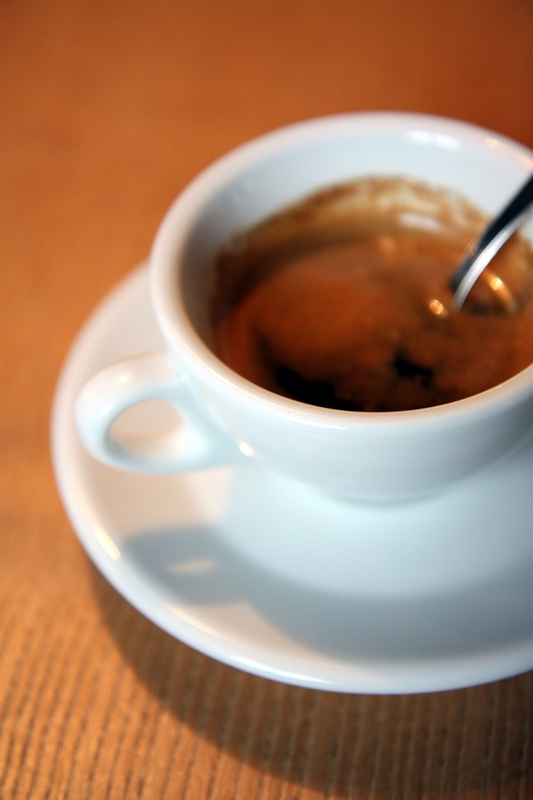 It seems to be a bit of compulsion and a need for some variety when it comes down to the moment of reading. I have known friends to take many more, and burn through them in a similar vacation-relaxation-reading zone. 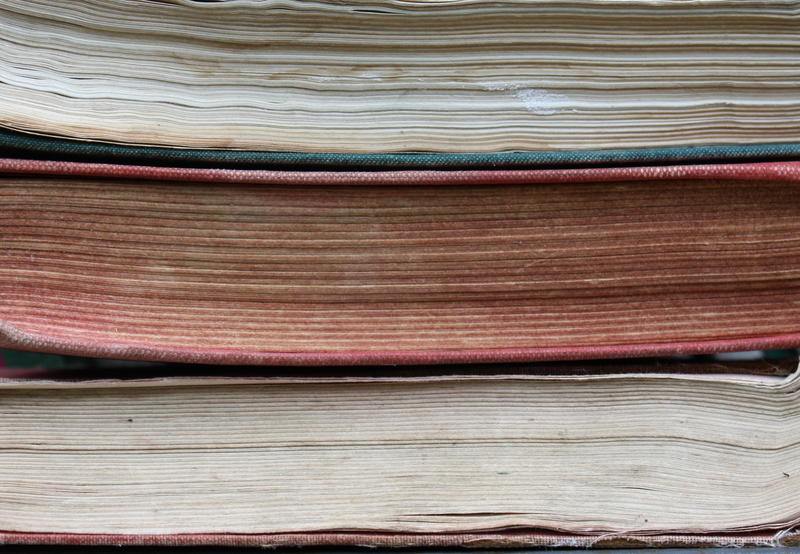 How many books do you take on vacation? This reading season, I am considering taking just two books of my own to read. It will force me to read the works of one writer in particular, something I have wanted to do but it might be intense. But it might be nice to not lug heavy paper objects up and down the state of California too, and better for my body in a wellness sense. 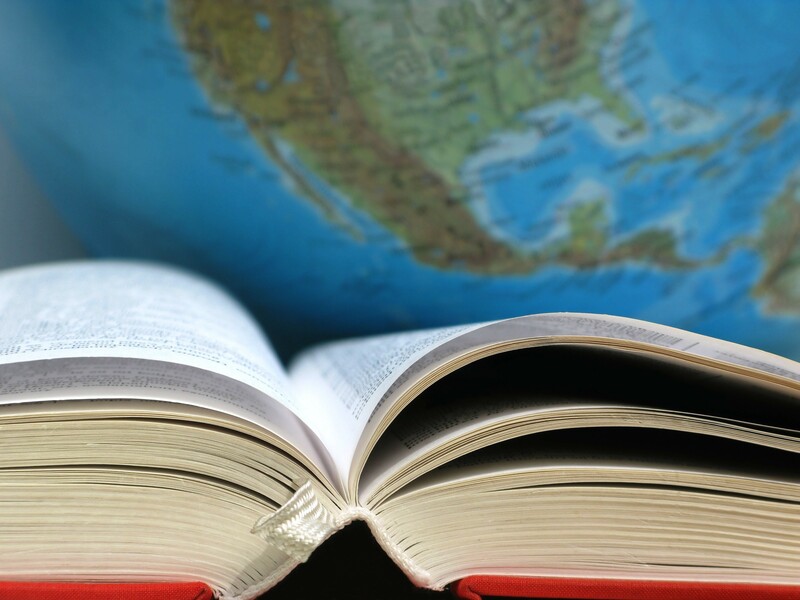 Any of you web wanderers out there, any recommendations on readings for this holiday season? Anything we should try to pick up at our public library or nearby used-bookstore before hopping on the bus to the train to the bus to the airplane to the car to the house? On Octopoe, we have explored some consumerist sides of the steampunk genre so far, via wedding cakes and then laptops. While we will revisit the idea of looking at consumer goods refashioned in a steampunk image, for now we move on to a meatier subject: how steampunk can be used in our visual media (in this instance film) to produce complex and interesting results. 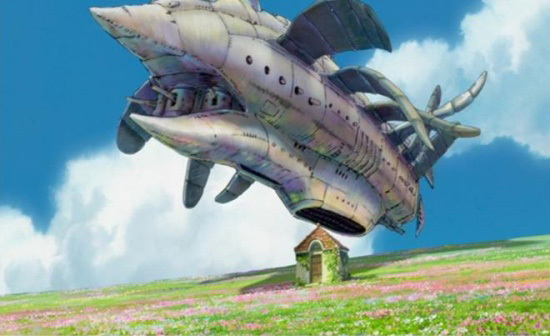 Hayao Miyazaki’s 2004 film Howl’s Moving Castle* serves as an excellent example of imagery that could quintessentially be called steampunk expressing itself in an effectively visual medium (the anime film) while drawing some interesting correlations with the historical record. The world created in the film draws many visual cues from late Industrial Age Europe, the half century or so that lead to the First World War. The humanoid characters are represented as white, and their fashion speaks to this time period as well. An unexplained war is taking place during the story, and there are scenes imbued with nationalistic representations. Generic flags are waving proudly; troops are marching off to their honored doom. Nationalism was a strong cultural trend in these years before the early 20th century world conflicts, and inevitably helped cause them. 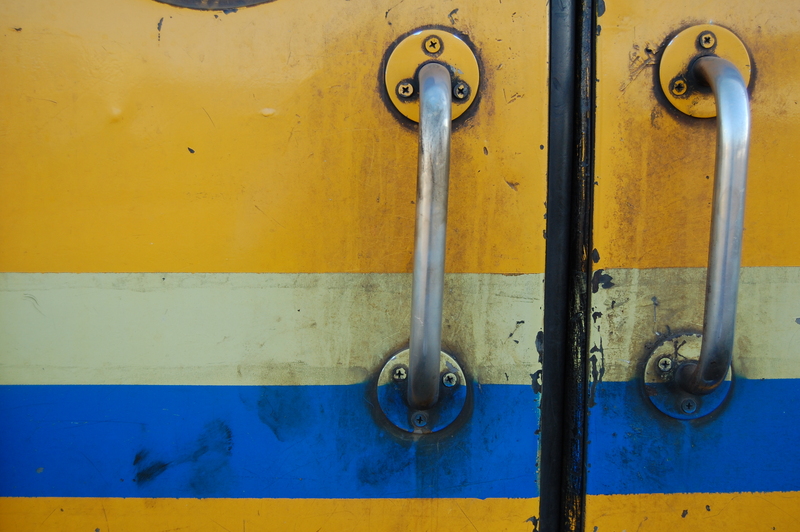 Any sort of moving machine in the film is almost exclusively run on some sort of burned substance, producing smoke or steam. Miyazaki treads familiar themes in this film nonetheless, and the more traditional futurism of the steampunk genre is replaced by a fantastical magical element that imbues characters and objects with power. In not relying on technology, he still covers the recognizable themes of human interaction with their environment, the roles of nature and technology in that interplay between the two—distinctly through some vivid and bleak images of a war made sinister in that we never quite learn the cause or history behind it in the story. However, no comprehensive summary will be provided here, nor will we be replete with images—it is assumed that you have seen Miyazaki’s film and remember the imagery and story (wholly or partially) or will rectify the omission in your film viewing lexicon soon, made amply easy by today’s modern technological luxuries. There is the wizard Howl’s mobile château itself, which builds on Miyazaki’s traditional theme of nature and technology, giving us a semi-anthropomorphic-crossed-with-beetle looking castle. Powered by the fire demon Calcifer, from the outside views it seems to be belching steam or smoke of some sort from the very first frames. Clearly mechanical, but given an instant magical quality. 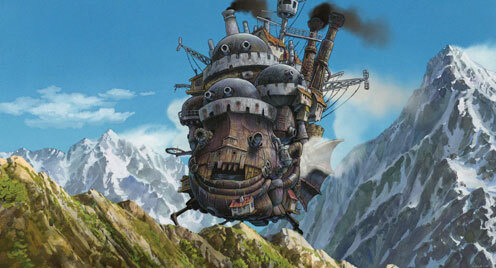 Miyazaki uses many fantastical and magical references in his films, but Howl’s Moving Castle is imbued with a more pedestrian stream of steampunk beyond the castle. The main character Sophie, and indeed their world, are depicted as being in an unnamed European-modeled country, as mentioned above, clearly at a stage of industrial development comparable to where Europe (industrial development came in stages at different times in different regions of the world… but generally) was at the time of the late 19th and early 20th centuries. 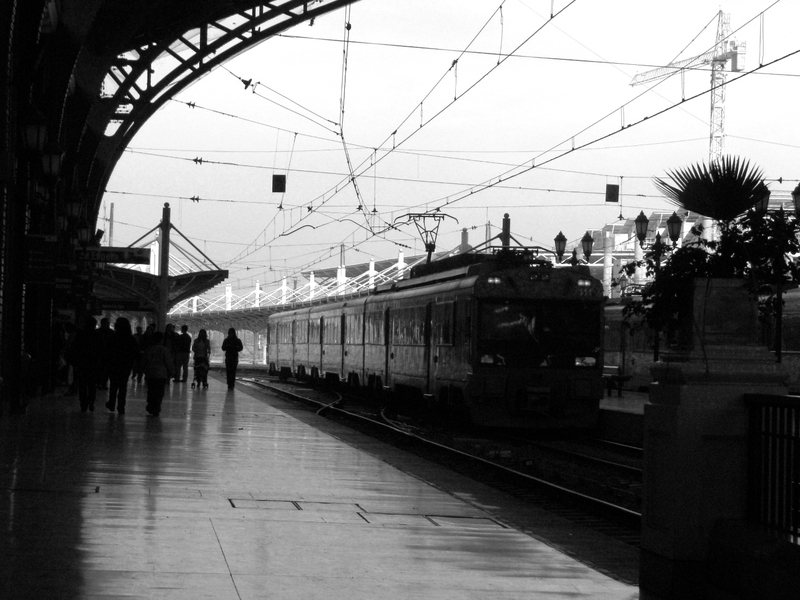 The cityscapes are filled with belching factories and crowded with European architecture. 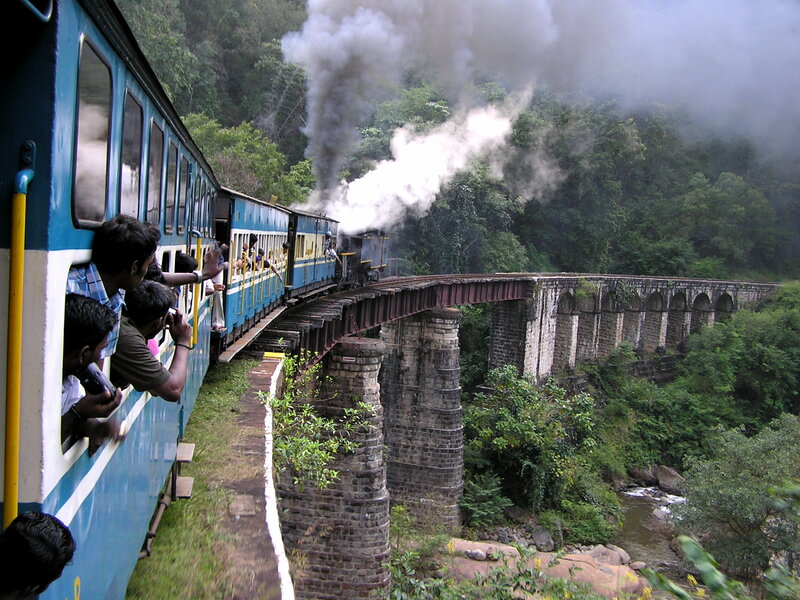 Steam trains and trolleys crisscross the landscape of the film’s visuals. 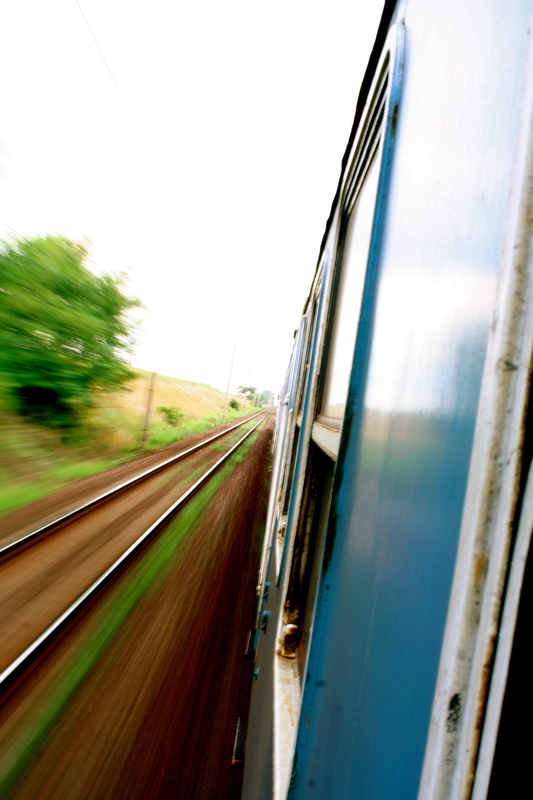 There are even individual steam powered cars, piloted by lone drivers or carrying a pair. Lecherous off-duty gendarmes prey on Sophie at one point, instigating her meeting with Howl, the wizard of the title. Other than this, these soldiers wear bright, continental style military uniforms and spend the rest of their screen time cavorting in plaza-side cafés or marching as riflemen in propagandistic martial parades alongside horsed soldiers and tanks. The images of war become more gruesome, and we get more images in a blend of futuristic, magical, and early 20th century military technology inspiration. Flight is a common theme Miyazaki plays with, and all sort of interesting creatures or things are taking to the air in his films. 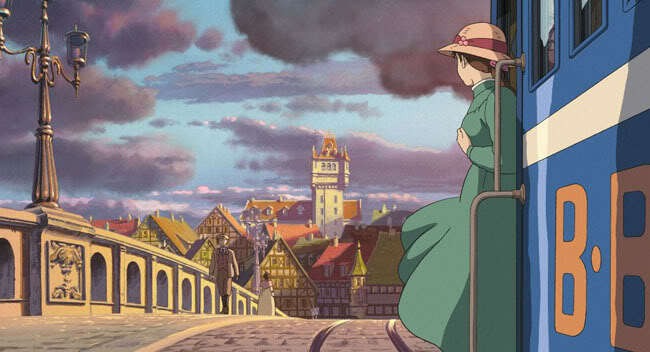 Howl’s Moving Castle is no exception, and we are shown some reminiscent scenes. Large airships sound a stark drone over the urban areas, dropping bombs in their wake. They are enormous, often taking the form of an aquatic bird, sometimes with fluttering insect wings. We get an ominous view of one behemoth replete with bombs, appearing almost like the eggs of some great flying mother beast who would relish nothing more than cracking their fiery innards across the industrialized landscape. Also in a more visually jarring image, some of the airships squirt out malevolent flying wizard creatures in this unsuitably organic fashion in order to attack Howl (who is flying around destroying marauding airships as a great bird-beast). We have many images of bombs being dropped, and Miyazaki does not shy from the imagery redolent of our own history. 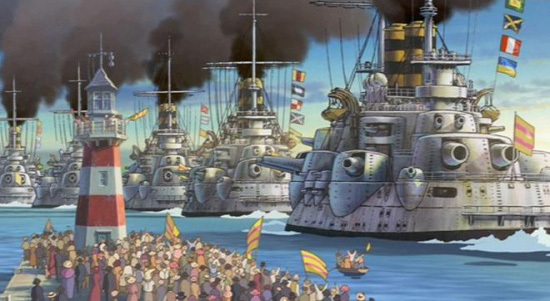 The war of Miyazaki’s film also takes to the sea, and includes a few appearances of great, tub-shaped battleships, proudly sailing out through resplendent harbors full of sailing boats. The military vessels are bellowing smoke, covered in deadly cannons. Later one of these ships returns to the harbor of Sophie’s city, badly damaged in combat, with sailors jumping ship into the water to save their souls. And with all of these images, all that horror of war, we can sort of reflect on these steampunk inspired images: the industrialized and Europeanized backdrop, the technological devices and storyline infused with bizarre, futuristic and magical images. One can begin to appreciate Miyazaki’s interesting role as a Japanese filmmaker and the potential commentary he is making through his choices of historical and cultural representations around the rise of industrialism and nationalism, which lead to the terrible conflicts in the first half of the twentieth century, not least of all for his native Japan. As a decentralized feudal oligarchy for centuries, Japan began a rapid western-inspired modernization in 1868 with what is known as the Meiji Restoration, an event which put power in the hands of a centralized state represented by an emperor, with power resting in the hands of a new ruling elite committed to the transformation of Japan. The country rapidly became industrialized in the western sense during the following decades, and due to the geopolitical implications of such development ran into conflict with another developing industrial power, Russia. The two states squabbled over imperial rights in northeastern China, fighting over economic access to Manchuria and general capitalistic and expansionary rights in Asia in what history calls the Russo-Japanese War of 1904-05. Japan had figured out how to play the same games as the European powers, and soundly defeated Russia and became involved in later European-based conflicts, notably expanding imperialistically at the expense of other nations in the Asia-Pacific region. Japan’s success caught up with her, ultimately being decimated at the hands of other industrialized powers in the competition for global hegemony that was the Second World War. 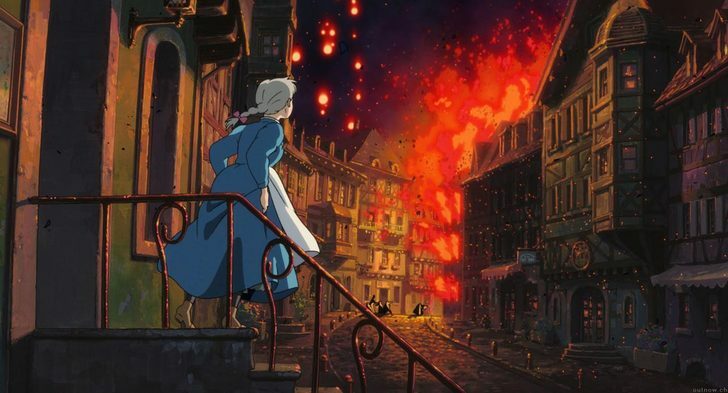 Miyazaki is no stranger to visiting the subject of war in his films, and it is interesting to consider his representations in Howl’s Moving Castle in relation to war as they mirror the historical context of the steampunk genre. While scientific advancement helped inspire the genre itself, new developments in economic systems and their technologies helped contribute to even more violent conflicts between people. We can come back to the similar questions, such as wondering about the merits of this militaristic competition based on economic systems and political beliefs that are unsound and unjust. Miyazaki, as usual, gives us a rich visual and thematic film that broaches these complex subjects. *This article deliberately does not discuss Diana Wynne Jones’ novel Howl’s Moving Castle, from which Miyazaki adapted his film. His liberties with the story separate these two representations adequately, allowing us to address the film here and not Jones’ novel, a luxury discussed in this post from December 3rd. Were not those that failed to learn from history doomed to repeat it? With Barack Obama gearing up another American surge, this time in Afghanistan, we could afford to look at a bit of history. 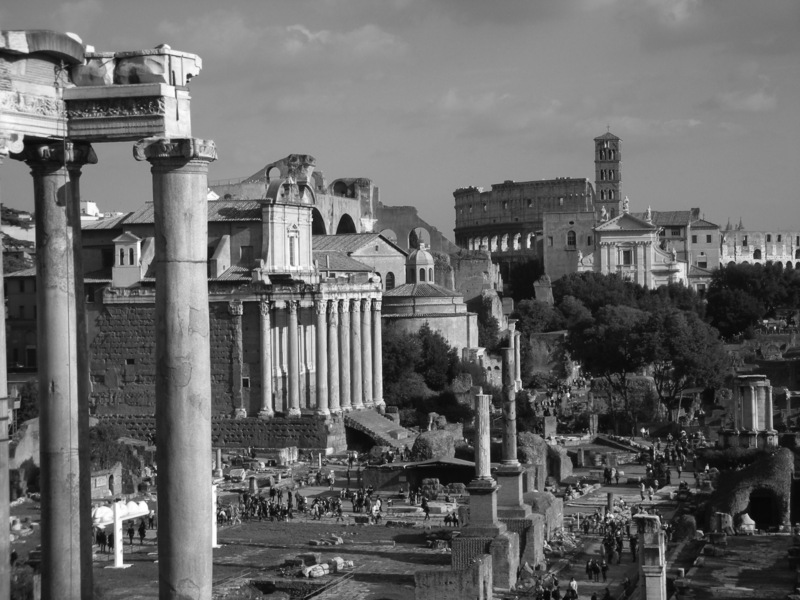 Let’s take a quick look at one of America’s most influential political, social and artistic predecessors: Rome. And this is not the Rome of the modern European travel circuit, but Latin Rome that began as an Etruscan influenced city-state ruled by kings from 600-BC onwards. About a hundred years later, the city’s aristocracy established themselves via coup as those enfranchised with power and formed what we could call a republic with the lower classes (who were given nominal representation within this power sharing system). Anyone who was not a propertied male did not have much voice or agency at all. Rome went on to clash with its neighbors, conquering them militarily and savagely working away at consolidating the entire Mediterranean basin into an economic and political unit that became the dominant power in the Western world in the years around the turn of the previous millennium. However, the original class based republic did not last. Hundreds of years into the republic the (in)famous Julius Caesar declared himself dictator in 44-BC based on his popular and military support, and was promptly stabbed to death by those same enfranchised aristocrats above (on the very floor of the Roman Senate – talk about political theater! ), not keen on surrendering power to one member of their class alone. Military struggles between factions ensued, and eventually Augustus Caesar (Julius’ chosen heir) won out in 27-BC, settling on a new constitution that claimed to “restore the republic” but in fact gave the Roman people a monarchical government. Augustus was princeps (first citizen), and his successors called themselves imperator (emperor), and thus the Roman Empire germinates around this time. America can take some strong points here for its own consciousness; examples that we could keep in mind as we evolve with the paradigm shift (which certainly will not be easy in proud and exceptionalism-minded America) that is coming with a multi-polar world of geopolitics: exampled by our intrinsic lock with China over finances, our historical/socio-cultural/militaristic ties to Europe, and dependence on (often hostile) oil-producing states. The imperial expansion of Rome introduced the same paradox that the Athenian Greeks faced between democracy (Athens was in fact a class/gender based democracy) and the pursuit of empire and subjugated peoples. The United States soon followed Rome’s precedential path from republic to empire in picking fights with both Mexico and Spain, amongst many others from Asia to Africa throughout its short history — sometimes acquiring vast tracts of territory and population, sometimes acquiring subtler or non-existent gains; look at the mess we caused in southeast Asia. A country which cannot afford or prioritize giving its people healthcare, building decent transportation networks (let alone high-speed trains), or keeping its education system credible cannot afford to militaristically harass far flung peoples. We have and will continue to expend enormous amounts of blood and treasure on our misadventures, clearly stressing our current creaking economic system. Hundreds of years went by for the Roman Empire before they succumbed to internal and external pressures, seeing generals vie for influence through military power struggles, eventually buckling under the immigration influx of what history has branded Germanic tribes, around 400-AD. * As the United States continues to face old and new pressures, such as relative power decline, economic strain and a continued influx of large numbers of immigrants (Spanish speaking peoples mostly, coming back to reclaim much that was stolen during a mid-nineteenth century war? ), it will be interesting to see what happens to this country. And now back to Afghanistan, where we seem to be further investing ourselves in an endlessly violent quagmire. Here we are hideously not learning anything from the historical record. Our predecessors the British in the mid-1800s and the Russians in the 1980s, were two other foreign powers that tried to control Afghanistan forcibly, to disastrous results. Sinking more resources into forcing our conceptualization of the modern state onto a people who are not accustomed to it, let alone did not ask for it, is not going to work out and it serves to only weaken the United States further. It will function as one of the external pressures like those felt by Rome in its twilight period. *For a hint of more context, this is when the beginnings of our ideas of France/French, Spain/Spanish, Italy/Italian et cetera develop in western Europe. To be truthful, I usually frown upon most literary narratives transitioned into film, as I feel that in their essence the two media are not capable of telling stories satisfactorily in a mutual way. Of course, each is enjoyed thoroughly by many people and independently of one another in their own contexts. Apparently having demonstrated our appetite for these adaptation films, numerous examples have been produced and actually make up a sizable portion of the overall mainstream film output. But gawd, aren’t most of them absolutely terrible? Do you remember when they tried to make Philip Pullman’s interesting and severe His Dark Materials into a film franchise with lots of lights, money and beautiful hollywood faces? (And rightly failed to do so) Zzz. Not all productions from literature to film are so hideous. Peter Jackson allegedly scraped by with his rendition of J.R.R. Tolkien’s epic work, The Lord of the Rings. But in the wise words of the character Val Goldman from the film The Birdcage — “Don’t add, just subtract.” — Jackson’s film seems replete with images that could have been spent on more accurately transitioning Tolkien’s detailed and simple narrative. But even the sage advice above does not always hold, demonstrated by the adaptation of John Berendt’s Midnight in the Garden of Good and Evil, made by Clint Eastwood, of all people. He embellished the role of The Lady Chablis, enriching and poking the story into interesting places, a rare example of a filmmaker adding some queerness to one’s work. Overall, it seems to be varied on how well the transition is made, depending on who does the work. So I will admit that a cringe was elicited upon realization that the previously seen but unidentified film poster at the Kabuki theater* in San Francisco was in fact an advertisement for an adaptation of Christopher Isherwood’s A Single Man. My evidence was found in this article from the NY Times. My love for Isherwood’s written works led me to masochistically devour the article and rush to the web for the trailer. The former designer turned film auteur Tom Ford gives us a version featuring credible performers, if clearly altered (clear from the article and online trailer) and looking to lean towards high drama. Isherwood’s novel is subtle as it is emotional and devastating; it will be interesting to see if Mr. Ford can stew these down into a visual and moving cinematic experience without serving us something overcooked, drowned in a flavor of Ford’s own publicity and ego. I hope to be proven utterly wrong**, and see the delightful balance that can exist between two executions in form of a single original story. Here’s to optimism. What will certainly be interesting to see is how much attention Isherwood the writer and his collective works receive in the release and attention around Ford’s film. Sometimes this can actually be the undoing of a piece of literature, at least in its mass-produced and marketed life. We have all seen the paperback transposed with movie poster at our local box bookstore. They have the ability to drain a lot of goodness from what would otherwise be a pleasant book experience, but should one complain if more people are reading said book? More people reading Isherwood’s writings is a great step in itself as they tend to be underread. *I was there seeing another book to movie transition, the Wes Anderson directed spin on Roald Dahl’s Fantastic Mr. Fox, which I found to be wonderful. But I have the benefit of not having read Dahl’s original (to be rectified soon thanks to the San Francisco Public Library), so did not have to suffer the burden of comparing. **I feel my interest in Isherwood will compel me to see Ford’s film. 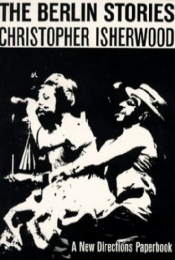 At least it will be worth comparing to Bob Fosse’s Cabaret, which is based on Isherwood’s Goodbye to Berlin.